3D Foundation Students standing by their projects, two large cardboard heads. 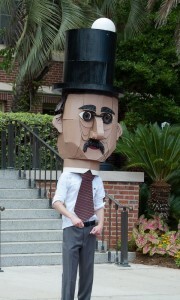 Student, Sam Jones wearing large cardboard head. 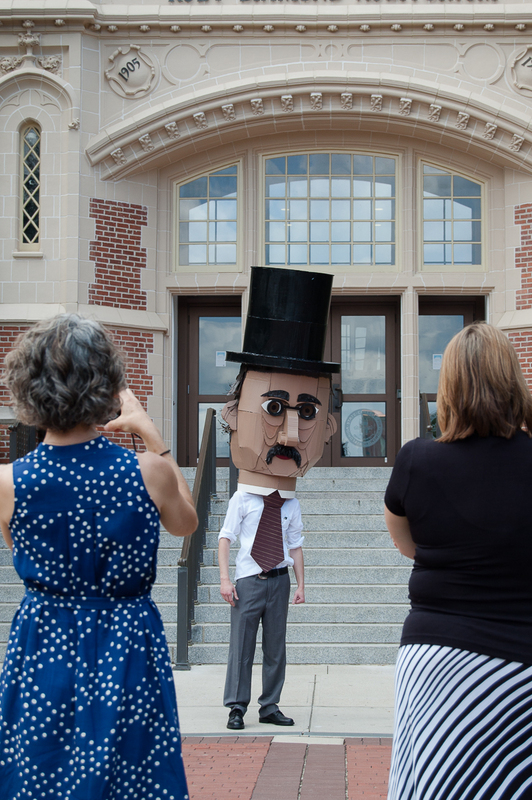 Several dozen students, faculty, and staff came out to the front of the Westcott building on Thursday, July 24th, for two large headed cardboard candidates. 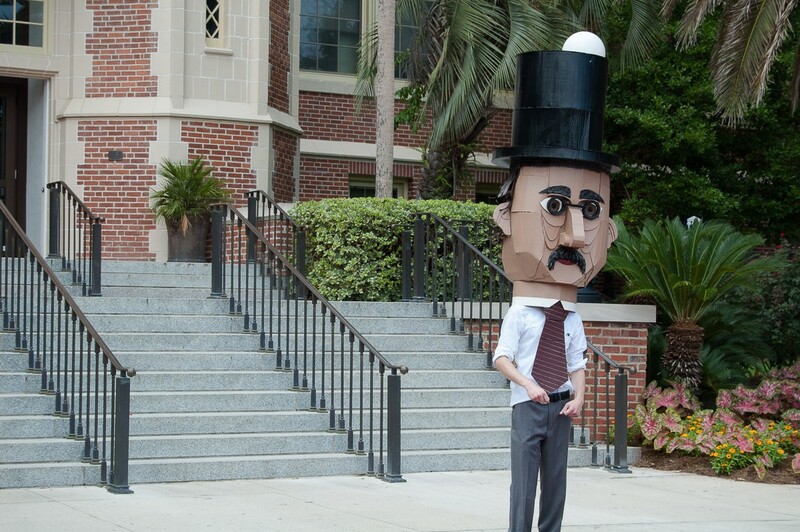 FSU Art faculty and professor, Anne Stagg gave her 3D Foundations students a timely and challenging assignment. 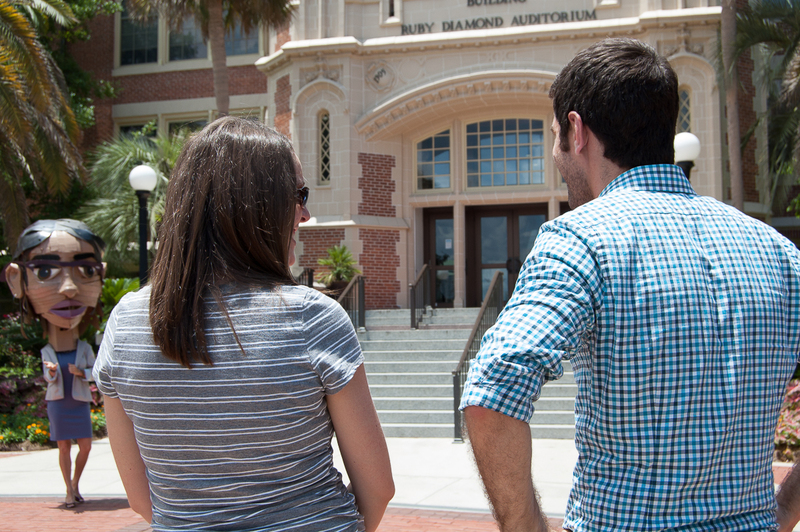 The assignment was focused on the upcoming hiring of our next FSU President. 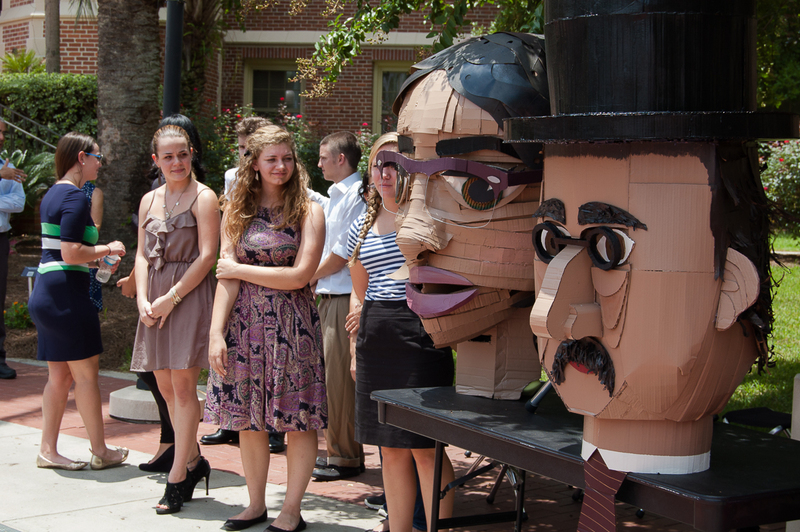 For this assignment, the students were asked to split into two groups and then tasked with the following: to design and build a job candidate for the FSU president position out of cardboard and write an accompanying platform speech. 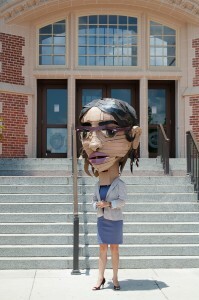 Student, Emily Hernandez wearing large cardboard head. 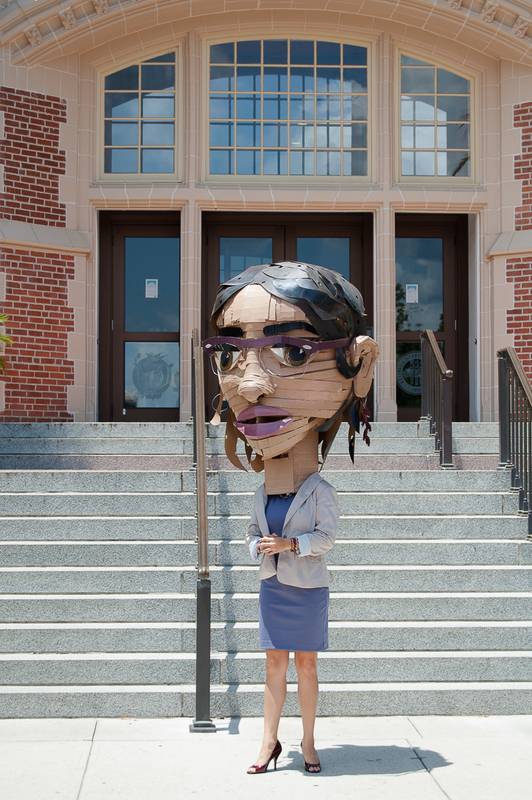 The cardboard candidates were larger than life (minimum three foot head) and each of their platform speeches was about 10-13 minutes long. Their job talks highlighted what the student teams discovered and deemed as important issues in the upcoming election. 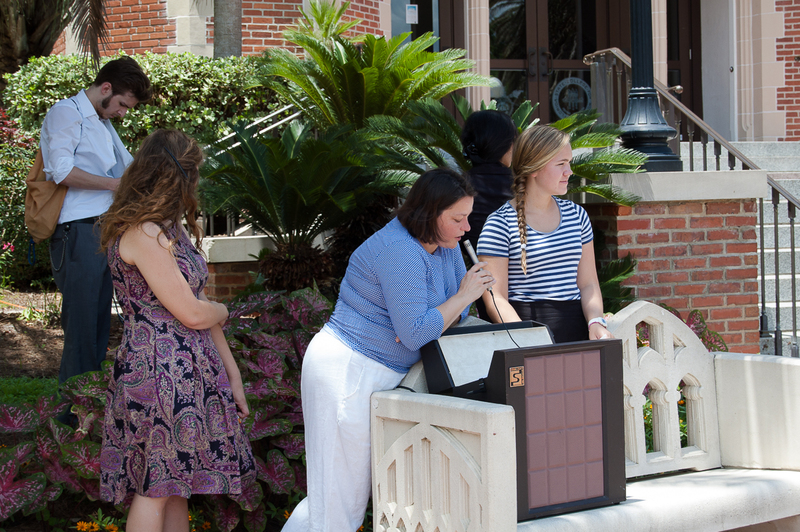 At 1:15 PM, a crowd began to gather followed by some words by the foundation class professor, Anne Stagg. Each team had someone introduce the candidates and one of the students from each team wore the cardboard head as the speech they created played in the background. Both teams commented on university topics such as financial aid, transportation and their promises to the campus once they attained the job. 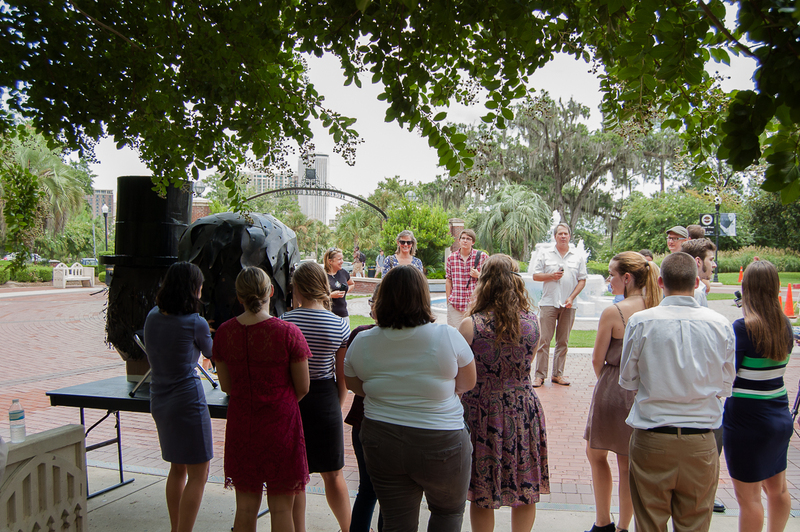 “The students’ projects – which included no mention of politicians or the Florida Capitol less than a mile away – melded political science and traditional art. 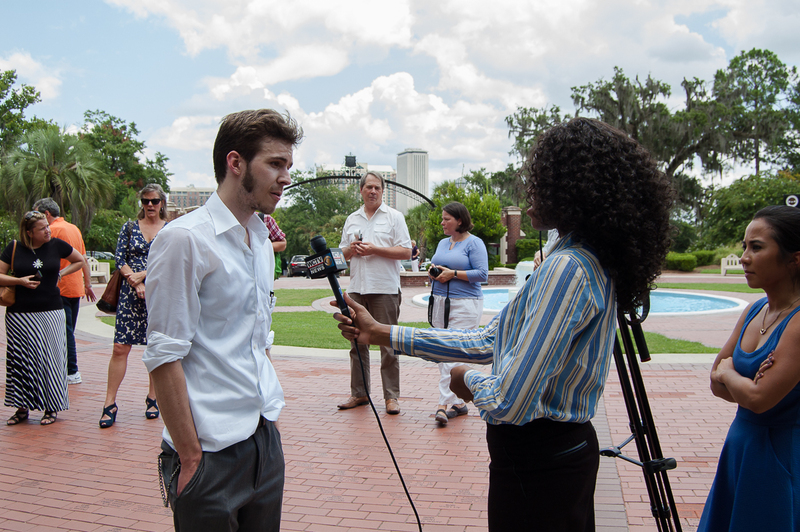 The candidates’ short speeches showcased in-depth familiarity with FSU’s administration, its goals and its challenges. Stagg said she had urged them to have fun, to ham it up. 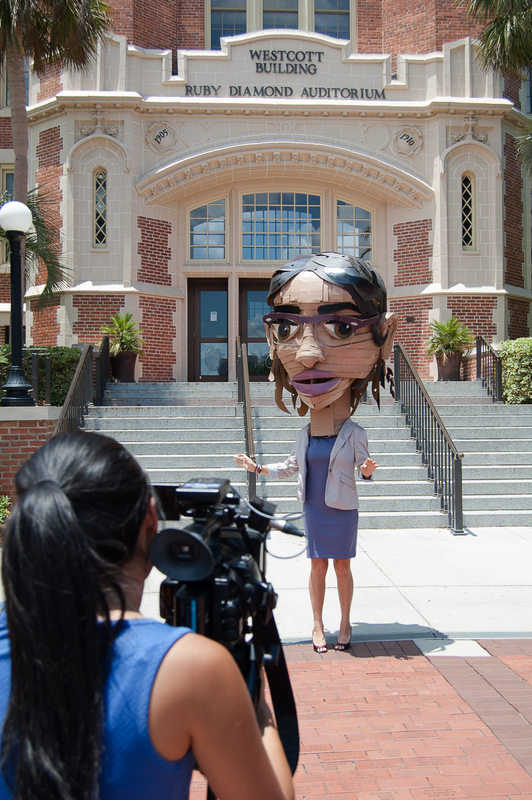 But the students-turned-candidates were in full-blown academic speak, despite the searing heat that Cameron Rosenthal, David Keller and Emily Hernandez endured wearing the cardboard heads. The full article can be read online on the Tallahassee Democrat News Site. For more information on the Art Department or projects like this one, visit The Art News Blog or the FSU Department of Art Facebook page. Video courtesy of WCTV, for the full story visit WCTV News.